What has been an awful year for Martin O’Neill as Republic of Ireland manager ended last week when he stepped down from the top job after a run of bad results and horrible displays. His last game in charge was away to Denmark last week which in a strange way was very ironic, because in the second leg of the play offs for the 2018 World Cup it was Denmark who came to Dublin and thrashed Ireland five one, it was after that game that it started to all go downhill. The fall out from that defeat was massive and in my opinion Martin should have possibly gone then. Relegation from their group in the Nations League signalled the end for O’Neill and his assistant Roy Keane. Keane himself had caused a few problems during the summer when he had a row with Harry Arter and Johnathon Walters as the pair sat out training. After that incident O’Neill stood by his assistant Keane and in my opinion he was wrong to do so, in the modern game it will always go wrong when players get abused by management and in this case it led to Arter making himself not available for selection for one game. Although Keane and Arter sorted out their problems later on, the damage had been done. This was just one issue out of many issues that led to O’Neill,s departure, but it was the manner of which they got a draw away to Denmark last week that finished it for me. After a boring nil all draw in which Ireland never had a shot on goal,the manager announced in his press conference that he was happy with the way things were going and was looking forward to the qualification for the European Championships in 2020. Now everyone knows Martin is good with the media but this was a step to far, he was fooling nobody and after a phone call from chief executive John Delaney the manager stepped down, the words mutual consent were used but effectively those words tend to mean your sacked. Looking back over his time in charge O’Neill did a relatively good job with the players available to him and the 2016 European Championships was a great time to be an Irish supporter, but that time passed and things rapidly went downhill. One other big influence on the decision to remove O’Neill was also the fact that the fans were starting to vote with their feet and leave the Aviva Stadium with plenty of empty seats. The dust had hardly settled on the news that O’Neill was no longer the manager when it was announced that the new man coming in was Mick McCarthy on a two year deal. Mick is expected to sign a contract over the coming days and he is expected to involve Robbie Keane in some role as part of his management team. As we all know this will be Mick,s second stint as Ireland manager and in my opinion it is a great appointment. 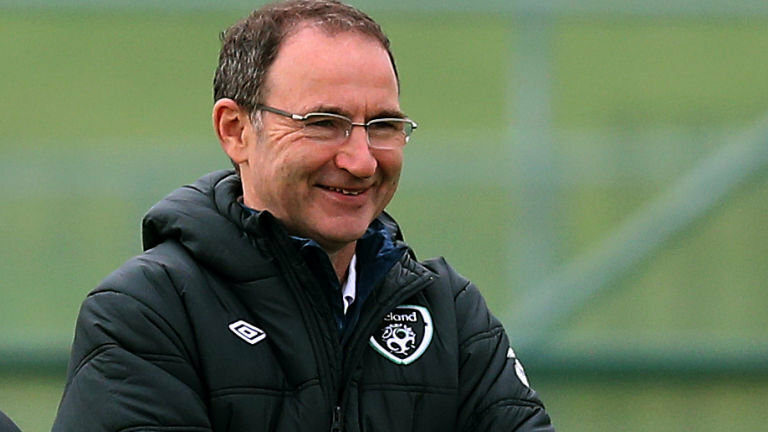 During his last spell as Ireland manager the style in which his team played was exciting and the fans believed in him. Unfortunately his last tenure came to an end in the fall out from the famous Roy Keane carry on in Saipan. Although he did not go as a direct result of Saipan it rumbled on and he was on a loser with a couple of bad results. The general feeling on the ground now is that this is a good appointment and it certainly has the fans talking. One interesting footnote to all this coming and going at the top level is the fact that the FAI have offered the Under 21 job to Dundalk manager Stephen Kenny and it is been reported they would like Stephen to step up to the top job in two years time when Mick steps aside. Now on paper this sounds like a great idea but I feel the FAI may have made a huge blunder by letting this news leak out to the media. If you look at the overall picture the question has to be asked that if Stephen Kenny has a bad run as Under 21 manager how in the name of god can he be expected to step up to the top job. Or what if Mick McCarthy comes in and does an unbelievable job and brings success to the role, does he then walk away ?. One thing is for certain though, the next couple of years are going to be very interesting in Irish football.